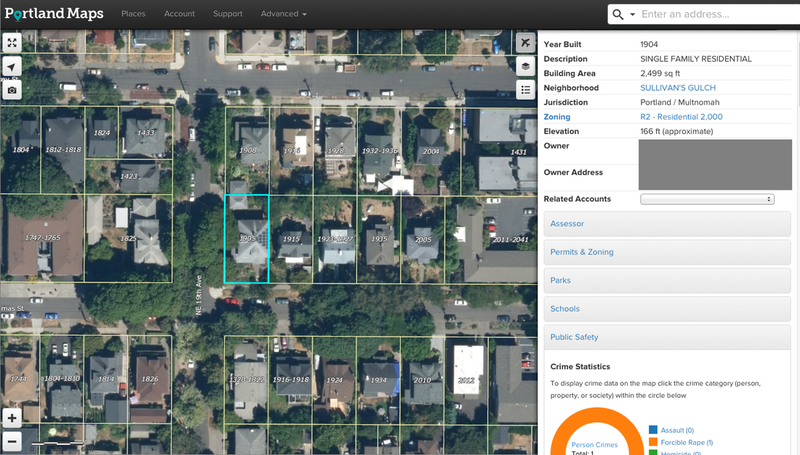 Portland Maps online is an amazing one-stop location for just about any piece of information you want to know about a particular property including ownership, assessment, elevation, schools, parks, zoning & development, water & sewer and natural hazards. Just enter an address, property account number, or map number. Sample. Not a live map. The City of Portland Bureau of Planning and Sustainability is updating their maps for environmental overlay preservation and conservation areas. The work effects property owners in Sullivan's Gulch that own land south of Multnomah Street. The work involves visual analysis of recent photos and LiDAR maps that may result in changes to zoning maps. No changes are proposed to the regulations for these overlay zones at this time. The East Buttes and Terraces Mapping Protocol link summarizes the work that is being done for our area and how to comment on the preliminary results. The affected Sullivan's Gulch properties are in resource site 139. Visit https://www.portlandoregon.gov/bps/article/706023 for information on how this process may affect your property.